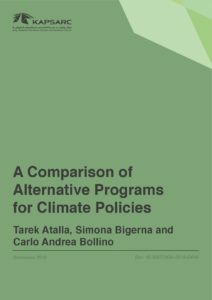 This research paper compares the relative welfare impact of different options for allocating the financing burden of climate change mitigation policies. Focusing on efficient ways to finance policies aimed at climate change mitigation, not only at direct carbon reduction, could delink the issue of carbon taxation from carbon emissions. A Pigouvian tax is the traditional way of correcting for negative externalities, or the undesirable consequences for society arising from the actions of a company or industry sector, by levying additional taxes on that activity. Pigouvian taxation corrects society’s welfare loss, however, from the viewpoint of the private sector, such taxation imposes a deadweight economic loss with respect to the original private equilibrium. 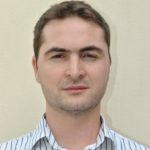 As an alternative, we evaluate a methodology that could fund investments to reduce carbon dioxide (CO2) emissions, and we show that the policy we consider to be optimal from a tax standpoint – Ramsey pricing can both improve world welfare and be politically more acceptable than other pricing options. Rather than focus directly on emissions reduction by taxing energy, a Ramsey pricing solution can be designed to minimize distortions while raising funds for investment in climate change mitigation. 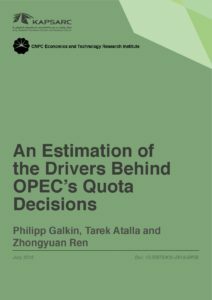 This paper identifies key determinants that appear to shape OPEC’s quota strategy and implementation. Using econometric estimations, it examines the factors that seem to most influence members’ adherence to their production commitments in the short term and what drives the organization’s quota decisions and level of compliance in the longer term. Future Business Models for Power Markets: What can We Learn from the ‘Sharing Economy’?